This year’s contest is finished! Congratulations, everyone and thanks for entering!! 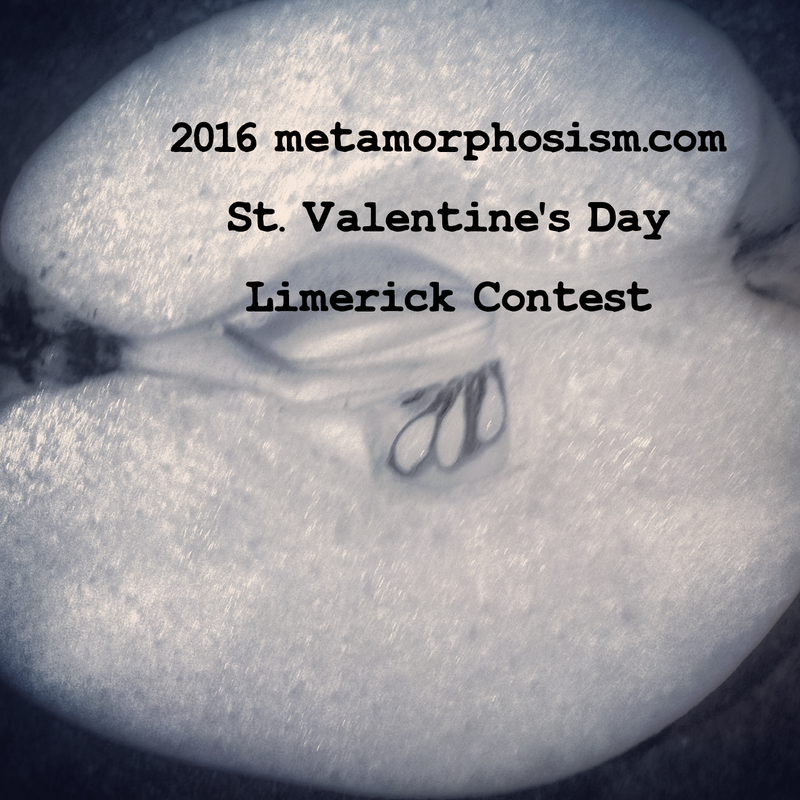 Welcome to the 2016 edition of the metamorphosism.com International Limerick Contest. All participants, new and seasoned veterans, are encouraged to consult the combined FAQ/rules below BECAUSE THEY CHANGE WHILE THE CONTEST IS GOING ON. Does it have to be a limerick? YES. The judges are very strict. Google proper limerick form if you are not sure. Do you mean 12 midnight on the night of the 13th or midnight on the night of the 14th? And which time zone shall have seisin of jurisdiction? We have had considerably confusion in the past! NINE AM (CENTRAL EUROPEAN TIME) 14 February. Oh by the way, I have a Quince tree on Cranes Lane. I think I should get a multiplier for that fact. OK, BY ALL MEANS. Secret multiplier in place. Is there a prize? NOT YET but that might change. I have 5kg of quince in my kitchen and hope to make some marmalade and some preserves tonite. UPDATE: I have tried the quince marmalade and it tastes okay so a winner could have a jar of that I guess, but only within Europe because shipping. Not sure about the quince/whisky preserves, haven’t tried that yet so no promises. HOWEVER ONLY ORIGINAL ENTRIES ARE ACCEPTED. PLAGIARISM RESULTS IN DISQUALIFICATION. Quince recipes, or other things one can do with quinces, or quince in general. NEW ADDITION—>Malheur National Forest, Malheur Wildlife Refuge, etc, including but not limited to recent events in them parts, although that might be low-hanging fruit. “The Revenant” references disguised such that they are not spoilers. plain text comments are fine, jessica! Word spread of her dazzling hue! Wiser now, she seeks a serious woo. Saw syntax evolve with the era. Oh crap, it was supposed to be in her VOICE. Lemme check out the Erowid. That quince tree must have actirasty. And his gaze only served to deride. Were the “No One Expects” Inquisition. For life to be slightly unreal. Of fixing one more simple meal.